Iowa DeLorme Atlas: Road Maps, Topography and More! Locate one of Iowa's numerous rail-trail bike trails! 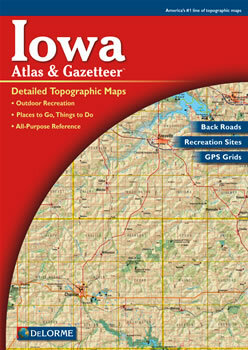 Get the state of Iowa in 51 large pages of up-to-date, shaded relief maps in the DeLorme Atlas and Gazetteer! The maps show state-wide topographic information using contour lines with intervals of 120 feet. The atlas has an index of place names and map features. The back cover of this atlas has a large map of Iowa with an overlying grid. Each cell of the grid contains the page number for a detailed map of that area. Many physical and man-made features are detailed on each map. These include: creeks, rivers, lakes, springs, ridges, forests, railroads, airports, reservoirs, dams, parks, roads, trails, highways and interstates. An additional 13 pages of reference information is included in this atlas. These detail attractions such as state lands, covered bridges, state preserves, biking, wildlife viewing, historic sites, canoe trips, fishing, hunting, camping, hiking and scenic drives. There are so many extras that you will be impressed with the DeLorme Atlas and Gazetteer!